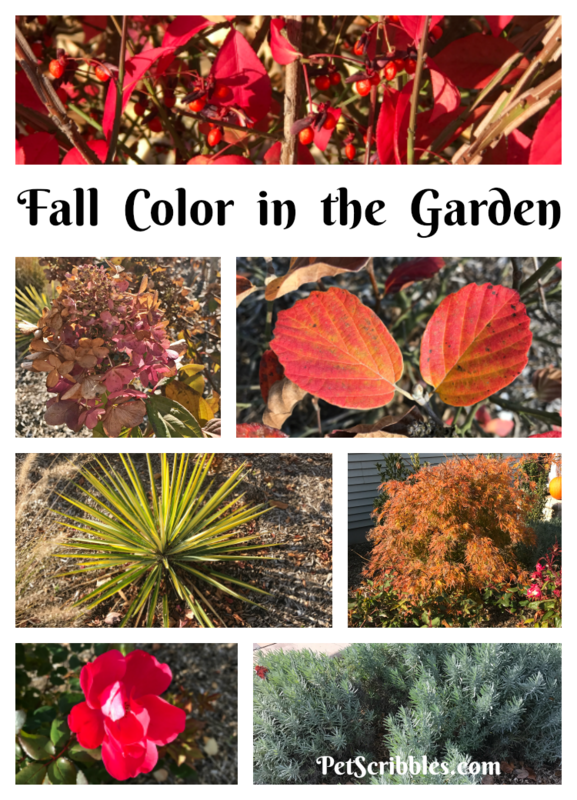 Learn how to get brilliant Fall color in your garden with my six easy tips! Look at your gardens right now. What do you wish you saw during the Fall season? Whether you have an existing garden that needs more color this time of year — or you’re planning to create a new garden — these six tips will help you get that gorgeous, brilliant Fall color in the easiest way possible! Normally when thinking of Fall foliage, people think of leaf colors on deciduous plants. But evergreens not only provide a backdrop to showcasing magnificent Fall colors, but evergreens can also be part of the color show! Here’s a shot from my office window of our front main garden bed taken in May. 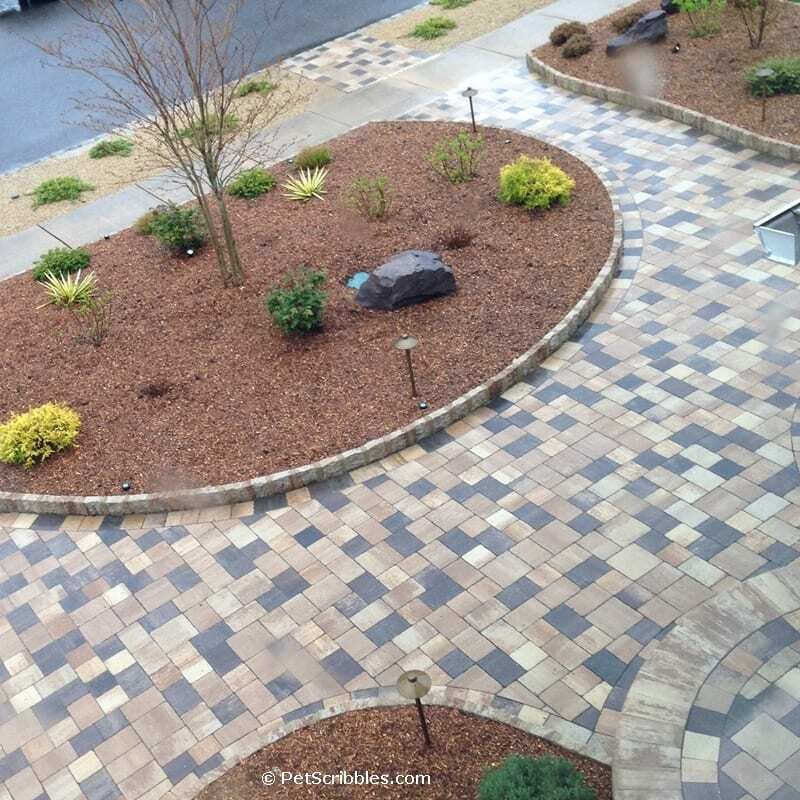 You can see how much it needed more evergreen color in general, while waiting for the other shrubs to start growing . . .
Armed with this picture and lots of plant lists — after doing lots of reading and research and driving my husband batty — we planted more evergreens. The center bed looked like this just one month later . . . In our gardens, we use lots of different textures and colors of evergreens, from a yellow-green Yucca plant, to a blue-green Blue Star Juniper to a darkest burgundy-purple Fringe Flower shrub. The additional benefit, of course, is that these evergreens are the stars of the show come Winter when everything else has died off. For example, we have a Winter Gem Boxwood tucked among our Limelight Hydrangeas. During the Summer it isn’t noticed, but come the Fall, the color helps the drying Hydrangea flowers really pop! 2. 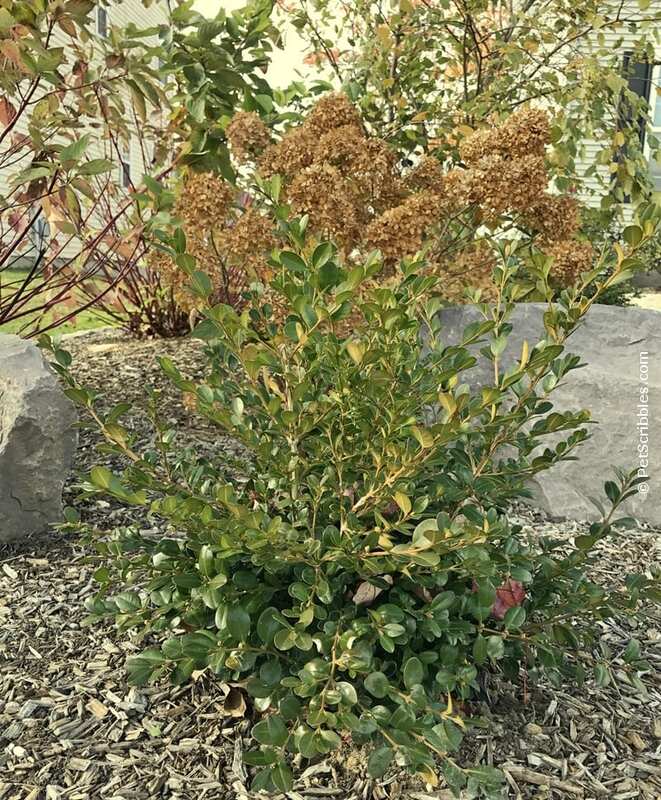 Use multi-season plants and shrubs! 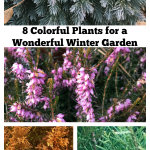 If evergreens are year-round, then multi-season plants are just what the name says. 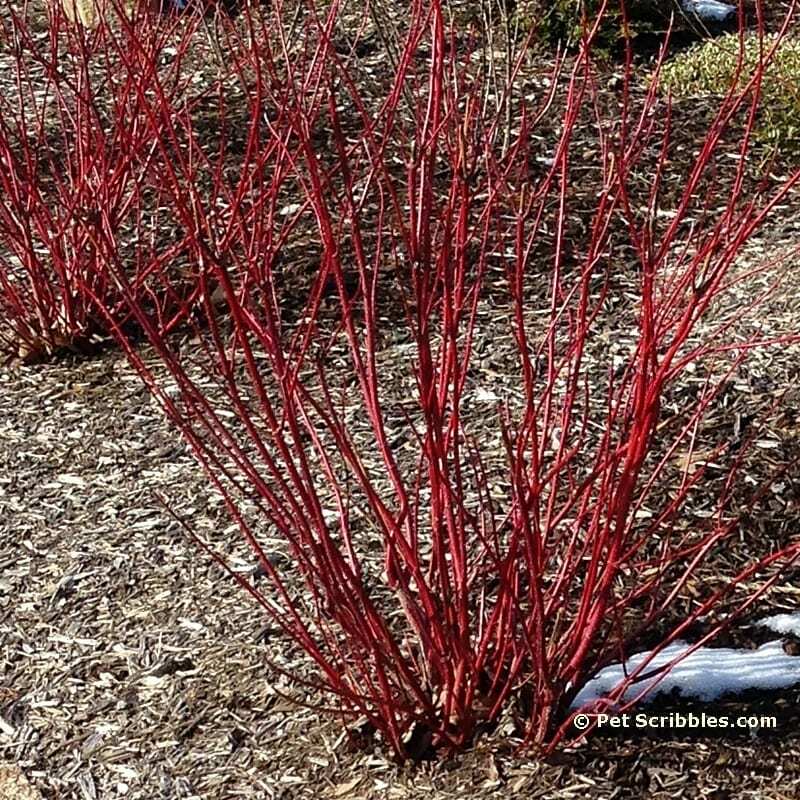 These plants are either three-season plants (Spring-Summer-Fall), or in some cases four-season plants — like Red Twig Dogwood, which loses its leaves but shows off its glowing red twigs which stand out in the Winter landscape — especially gorgeous against snow! In our backyard gardens, we planted a dwarf Hinoki Cypress that almost looks like a small Bonsai tree next to a tan-colored Toffee Sedge ornamental grass. The Hinoki looks and feels all soft, while the grass has a weeping look of many individual grasses. 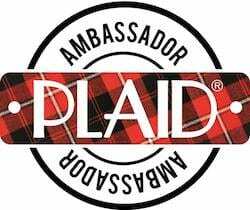 Another example of mixing textures? Bunny Grasses planted next to Roses. The difference in textures, especially in the Fall, is striking! 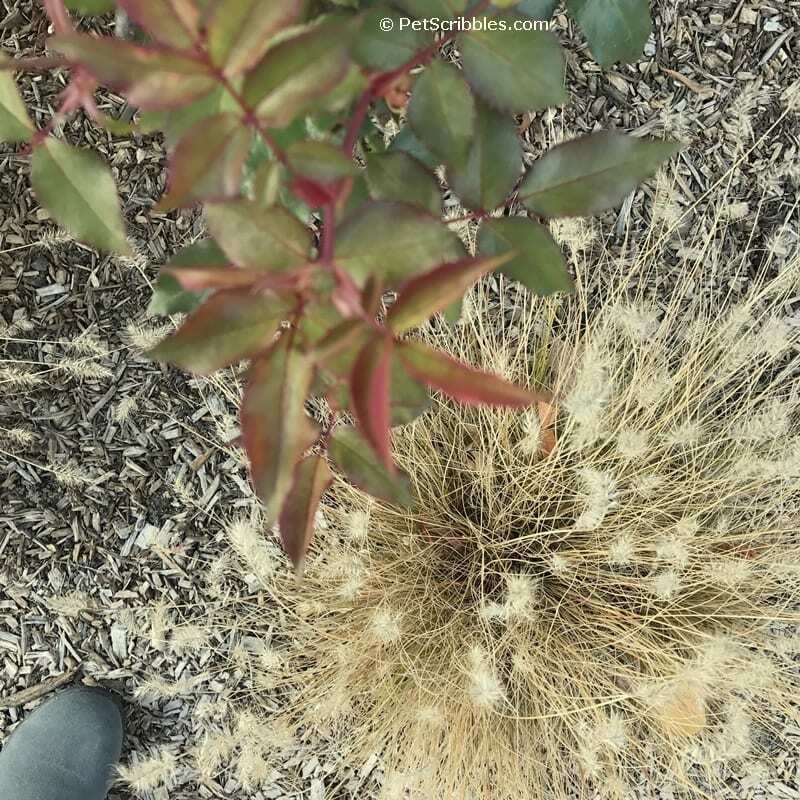 You have the Knockout Rose leaves starting to lose their lush green . . .
. . . And you have the fluffy seed heads of the dried Bunny Grass underneath! 4. Mix sizes and shapes! Related to the one above, yet a different tip. Plant a ground-covering Creeping Juniper near tall ornamental grasses or Hydrangeas. 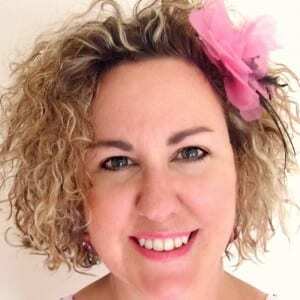 Tuck in some evergreen Candytuft (click to read my popular Candytuft post) in front of Roses. In both examples, you’ll have tall and short, mixed with evergreen and deciduous, so something will always look pretty year-round. Playing with heights also draws the eye around the garden in a unique way, versus just a basic front-to-back, shortest-to-tallest design. There’s so many ways to design your gardens for color, from a monochromatic white garden, to multi-colors and everything in between. 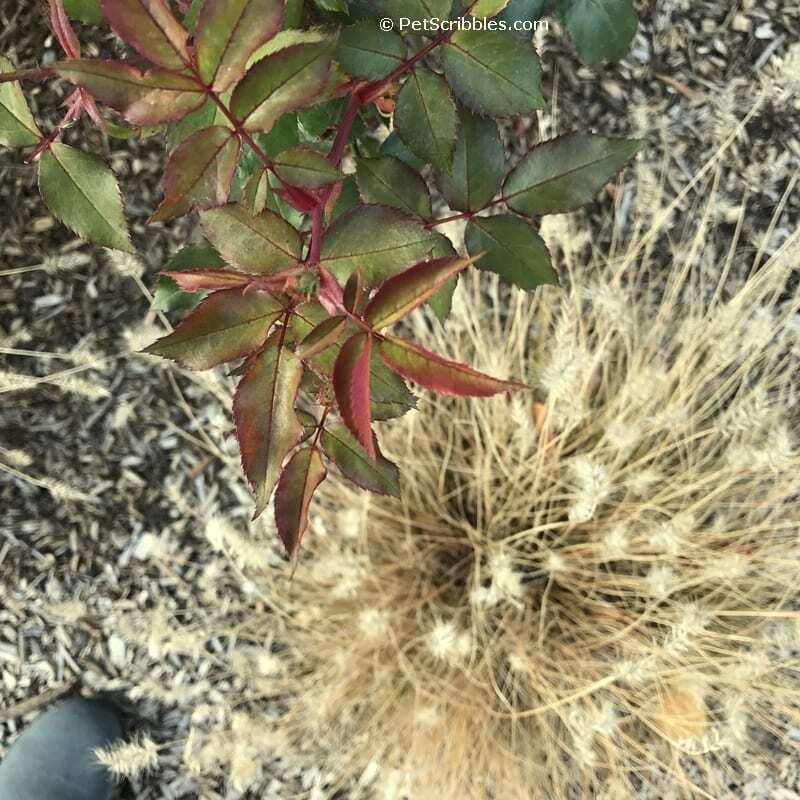 When shopping for perennials and shrubs, pay attention to what the Fall colors will be. We didn’t have any particular color scheme in mind, but I knew I wanted lots of color as much as possible — year-round — and I think we’re getting there! I sometimes fall in love with shrubs specifically for their color, such as the many different varieties of Barberry. You can find a Barberry in just about any color, from bright orange to deepest burgundy to chartreuse and everything in between! We planted two Orange Rocket Barberry shrubs this year, and although they won’t keep their leaves come Winter in our particular garden zone, the shrub still has an interesting shape with its twigs. Above is a section of our center front bed. In the very back is a Gold Mop Cypress, in front of it is an Orange Rocket Barberry. 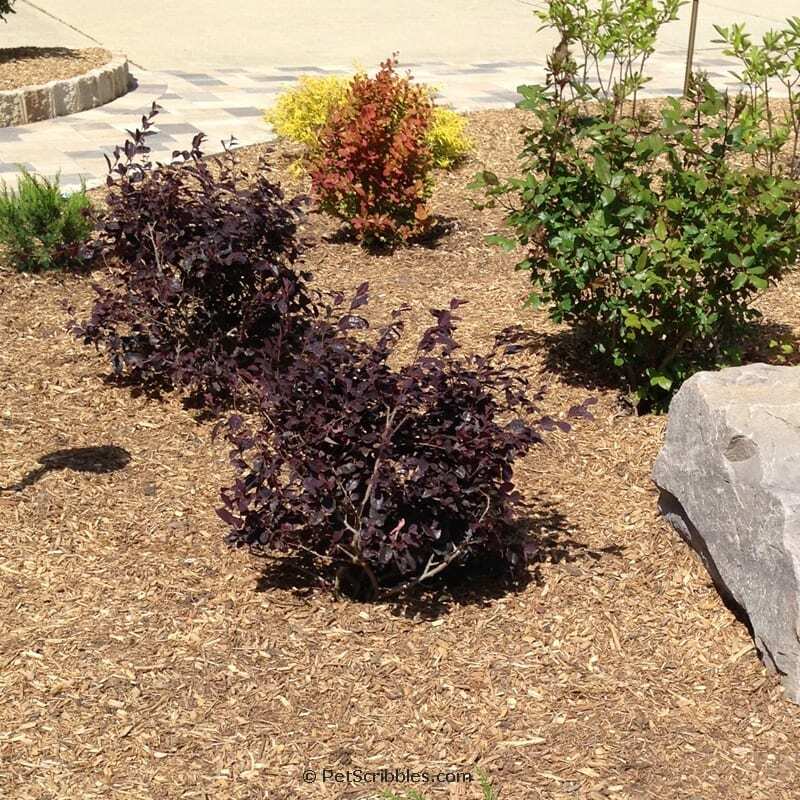 The two darkest burgundy-purple shrubs are evergreen Chinese Fringe Flower shrubs. To the left of them is a small Shore Juniper. To the right is a Knockout Rose bush, and behind the roses are the Pinky Winky Hydrangeas. 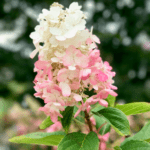 The Chinese Fringe Flower shrubs should be covered in Fuchsia flowers in the Spring, so I’ll keep you posted with what we actually get next Spring! 6. 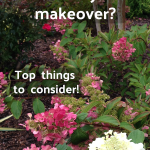 Keep flower heads on plants and shrubs! Fight the urge to prune everything down in the Fall, especially early in the Fall. From the dried centers of tall Brown-eyed Susans and Coneflowers to the orange rose-hips that develop on the Rose bushes, to the lovely and delicate look of the various dried Hydrangea flowers — it all goes together and adds up to a colorful show! An extra tip for the Winter garden . . . 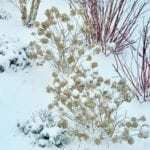 Try to keep your Hydrangea flowers into the Winter season, especially if you live where it snows. Trust me, the first time you see a snow-covered dried Hydrangea flower — or the first time you see one covered in ice — you’ll thank me! It’s almost magical and fairy-like! Of course I freely admit that I will cut off at least some of the dried Hydrangeas to bring inside and decorate with! 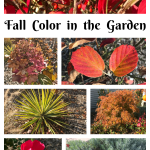 Ready to tour my Fall garden beds for more examples? 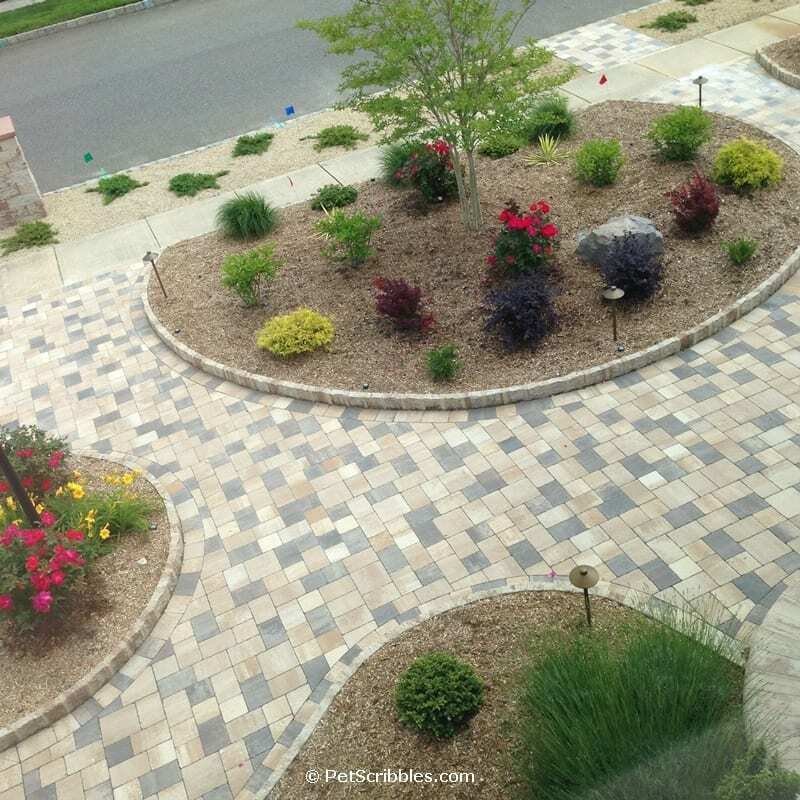 How to plan your dream front yard! 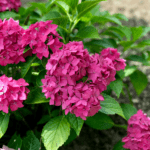 Pia Hydrangea: a pink dwarf hydrangea you’ll love!